The WLS-25 obstruction light has the advantage of shockproof and can withstand the harsh effect of the environment. The WLS-25 is a low intensity solar powered steady burning aviation obstruction light that is suitable for use in places without electricity. There is no need for maintenance and management and it offers automatic control. This product can continuously operate for 7 days without any sunlight. 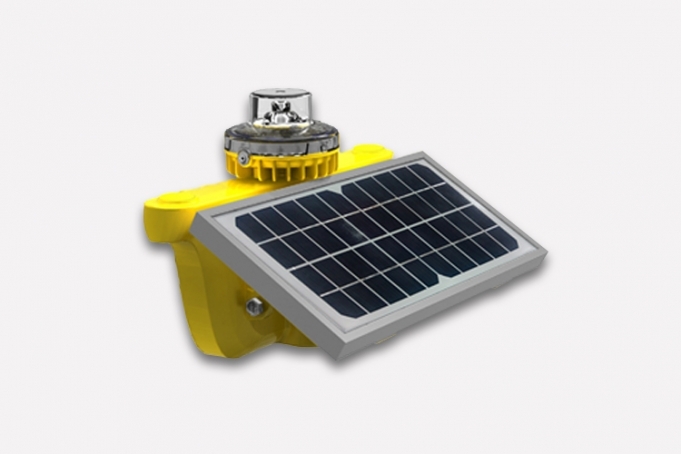 This product has a standardised design which includes an aviation light, a silicon solar panel and battery. It complies with ICAO (Annex 14) and FAA. The enclosure of this light is made of die casting aluminium (LM6) and is powder coated. Its advantages are that it is lightweight, waterproof, shockproof and corrosion resistant. The lamp has a built-in controller, a multipoint control unit (MCU), that allows the lamp to manage fault detecting, circuit-measuring, circuit-protecting, circuit-monitoring and solar system protecting. The silicon solar panel has the advantages of a high conversion rate, small scale fading, good reliability and external longevity. The mounting bracket for the solar panel is made of stamping parts, which can withstand the harsh effects of the environment and can also withstand strong winds of up to 100KM/H. Its inclination angle is 15 – 60 degree. The built-in battery is a NiMH battery for ease of maintenance.